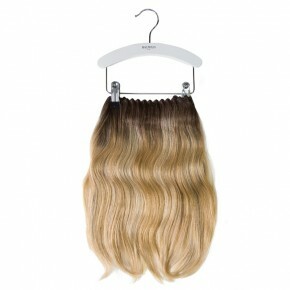 The Hair Dress Human Hair 16″ is available in 4 singletone colors, 4 ash tones and 9 ombré colors. As the natural hair color adapts to every season, it becomes lighter in the summer and darker during the winter, the Hair Dress ombré colors are developed with a “Sunrise” and “Sunset” side. The Sunrise side is layered with a lighter shade and the Sunset side has a darker shade. If you consider to color the Hair Dress, we highly recommend to use level colors (L10, L6, 4, 1B) instead of ombré colors. Read more about coloring Balmain hair extensions. Make a section around the crown area of the head approximately 4″ from the hairline. Secure the section with a clip on top of the head. Lay the transparent strand onto the section. Release the section. Comb the natural hair over the transparent strand for invisible integration. For extra grip, sew the 2 small security clips onto the weft. Apply the Hair Dress as usual. Secure the clips for extra grip.